It's the United-way. A lot of numb nuts posts in this thread it seems. Way too early to make your mind up on players. In a few years you are going to have people on here bragging about learning from their mistakes with Januzaj and Macheda "I predicted this failure from the start, Chong didn't have the talent and I knew it immediately" That is the end game here for some of you, what is the point? Agenda posting and strong opinions formed and fuelled by opposite views should only be allowed in threads for players over 20 with more than just less of one first team game. If you didn't watch the game please don't read the comments. Absolute nonsense is being spouted here and I have no idea why. This is exactly my point. If this was Mata or Rashford's first game for United, would you write them off immediately? Chong is a potentially great player with a good understanding of the game. He'll make a difference soon from the right. Believe me, the Portuguese fans were unanimous in rating Quaresma as the better and more complete player as teenagers. You could find threads on here too, where Portuguese fans were saying the same. I thought the same, but then Gomes looked totally unfazed by the occasion and very natural in his last cameo, while Chong showed nerves. Both of them are very good talents, and I hope both of them make it. I am personally inclined to not judge Chong so hastily. Not everyone is a Scholes, or a Rashford. And Beckham already had a certain mystique about him before he got his debut, with excited whispers of "He scored a goal straight from a corner, you know" on the lip of fans and onlookers like. But not everyone who've had brilliant debuts end up sustaining their form. I know many here fear that Chong ends up being a letdown, but I think it is way too early to make that call. Let's see him play as much as Luke Chadwick did, and then decide whether he's just another Luke Chadwick. Yeah, that is a genuine concern for me too. I hope Chong manages to eventually take it all in his stride. I know this sounds counter-intuitive, but I hope that he forgets that he is playing for the first team, that he is able to blot out the momentousness of the occasion from his mind. There are other things to get tensed about on the pitch. I hope he gets more time to impress, but also more time to decide whether the pressure that comes with playing regularly for Man United is something he wants in his life. For Luke, it wasn't. Let me guess, he's already trash? You can't judge him harshly based on his cameo surely. We do indeed need to be objective and calm about the situation, yes there is a potential that he might not make it, but at the moment there is equally enough potential that he turns out great for us, many youth products are freaks, in the sense that the Co92 was a freak class, you don't come across the likes of these and Giggs and Ronaldo everyday, if you did nobody would have a need to buy players. 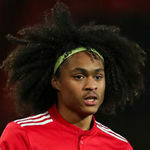 Ronaldo joined us at 18 and looked like he owned the stage, Chong is 19 but not everybody is a Ronaldo, we definitely need to give him more time, but I don't believe he is ready for the first team anytime soon. It is true that what you see in the academy and youth matches does not necesarilly translate when you graduate, this is always a risk, getting too hyped up on your own prospects which we as a fanbase do seem to suffer from, however it was a small cameo, keep your heads, let the boy mature a bit more and get some first team matches under his belt. It is the stupidest claim to brag about too. I could go into every youth player thread and say they have no chance of making it and I'll be right like 99% of the time because statistically that is just how it is. That doesn't stop them from having a chance though. Yep. His man Utd career is over. They've had enough of him. I really like him. He might not be the next Messi which is what everybody hopes for and why they all scream and shout for youth to play only to be disappointed if they are not the best player on the pitch form day one but he could certainly end up being a player in a similar mould to say someone like Mane? that would be great for a youth product and will also be exciting to watch for years to come. I personally can not wait to watch more of him. Just out of interest does he play much on left and play similar to some one like Sane or is it exclusively on the right cutting in for shots? Well we have a lot of experts on talent around here it seems. Theoretically, it does affect his ability. Hair can get in the way, opponents can pull it. Going bald is the best for aero dynamics. Came here to try and get some more info on what he's like at youth level and what to expect in the future. Instead what we get is people writing him off after one cameo. The admins need to do some quality control. What are people basing him being nervous on? He didn't look nervous to me. I thought he looked very good. Got on the ball as much as anybody, made some good runs with the ball and made an excellent run without the ball. He played one very over hit pass and that was the only time he gave the ball away. Not sure what downside people are seeing or why people think he was nervy or hiding? I'm looking forward to seeing how he gets on. Looks like he's got something. How can anyone base an opinion on a rubbish and pointless 30 minute cameo in a game where we were absolutely awful? Some people on here consider him useless because he didn’t bang in a hat trick after coming on. Think Chongy should go on a loan next season, preferably to some EPL club but if that's not possible than to a championship side where he would get some regular minutes. I think loans are not as effective as they used to be at the moment, particularly in the league and championship. Clubs in the league are constantly fighting to stay up and championship games can be fierce when fighting for promotion. If a young loanee has an off game or two, you find them benched soon enough. In short, it's not always the best place for player development. Look at all the players who have gone out on loan and how it's actually affected their chances in the first team. Even successful loan spells don't mean a smooth transition to the first team these days. The better option to me is to make sure they get game time in the reserves and give them the odd first team outing in cup games. I'd only consider sending them out on loan if they're pushing for minutes in the first team and are unsatisfied by the speed of their career progression. I get your point but don't think U23's are competitive enough you know. Some mid-table championship club that has EPL ambitions but don't have good enough squad nor the money needed would probably take him on a loan and give him some good playtime. If we get a proper, young RW don't think he'll get much chances hare and it would be a waste. Would love for him to get some taste of a more competitive and demanding rhythm, to get some confidence going. Nothing against that really but not every young talent going to bundesliga is gonna pull a Sancho mate. I was thinking more of Reiss Nelson (and a few others), getting regular games at a decent club. The main point being they seem more willing to give players minutes over there. Right, was reading about him the other day, good move by Arsenal. Could work, Liverpool has Grujić in a Hertha doing great as well. He'll be 20 this year. The guy needs to play. I don’t think age really matters all that much. When Lingard got loaned out he barely got any game time at that age. It’s rare to actually have a successful loan and for Chong being so raw he won’t get any time in my opinion unless it’s to a much lower team. You know when Chong made his first team debut, he was so far out of his depth. You think he's going to wait around to play reserve football into his twenties? So the best thing for him next season is stay in reserve team? Not many players out there can be like Lingard, got intelligent movement like Lingard, versatile like Lingard and willing to wait the time until 23 years old. He's not good enough yet. Just because he looks good at this level doesn't mean he can step up, especially with the games coming up. He definitely should go on loan or get some game time in our first team. Seems bizarre to say but considering he’s approaching 20, the clock is ticking. As others have said here, he’s a very different player to Lingard, who is our example of “he’ll come good in his mid twenties” - he relies on his pace, trickery and unpredictability and those sorts of players are the ones that either make it early (because their talents are too hard to ignore) or they don’t make it at all. He needs to learn to take the things he does and adapt them to a game that has real stakes against people that will literally run through you to get the ball, whereas Lingard already had the movement and ‘game smarts’, he just needed to overcome his injuries and get stronger. Also think he should bound his hair together when he's on the pitch (like VVD) does, that thing is wild.